An updated classic for the modern gourmet - ideal for your cheese and artisan bread. 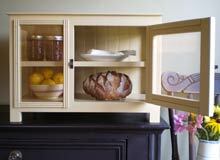 This cabinet is beadboard backed, with bronze screen and oil rubbed bronze hardware. 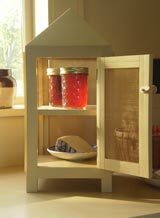 Made with solid poplar, pine bead board/moldings and pictured in Shelburne Buff with oil rubbed bronze hardware. A companion to our larger Golding Gourmet will fit easier on your countertop since it is about the size of a coffee maker. 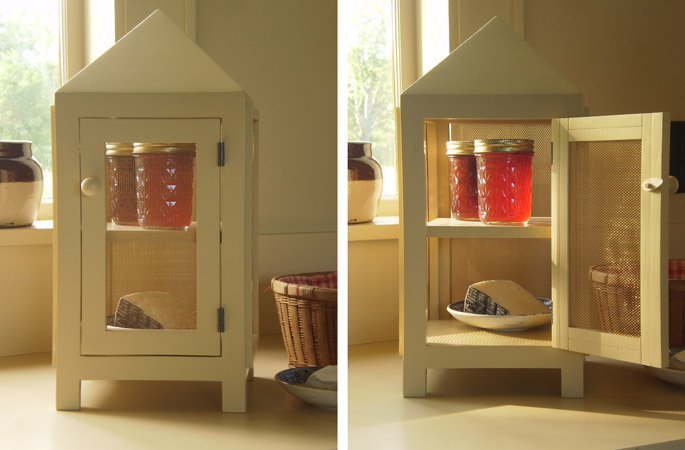 Perfect for your fresh fruit and cheese. The cabinet's shape is inspired by an antique lantern - all 4 sides have luminous bronze screen. Made of solid poplar, the door fastened with a wooden knob with a simple handcrafted turn-catch and adorned with dark antique solid brass hinges. Pictured in Shelburne Buff.